At the G20 summit in Hamburg over the weekend, German Chancellor Angela Merkel and other European leaders were among the few advocates for free trade. In a summit declaration heavy on weasel words such as “reciprocity”, “mutual”, “trade defence”, “level playing field”, they managed to insert a commitment (with caveats) to “keep markets open”. Which begs the question: With President Donald Trump leading the US in an increasingly protectionist direction, might the EU be able to take the lead in freeing global trade? Unfortunately, that may be too much to ask. The good news is that the latest Global Trade Alert report finds that G20 members — with the exception of the US — are resorting to protectionist measures at a lower rate than in recent years. Better still, the EU has reached political agreement on a free-trade deal with Japan that would create the biggest free-trade area in the world, as Hosuk Lee-Makiyama explains. But while Brazil and Argentina are also trying to open their economies after decades of protectionism, most G20 leaders are reluctant liberalisers at best and some are outright protectionists. While Xi Jinping portrayed himself as a standard bearer for globalisation at Davos in January, China is scarcely dismantling its barriers to foreign investment, which are among the most stringent in the world. Narendra Modi is keen on attracting foreign investors, but India’s tariffs on industrial products remain sky-high. Turkey violates the obligations of its customs union with the EU, adding taxes, licences and costly import procedures that make trading increasingly difficult. Vladimir Putin has overseen a rise in protectionism in Russia. And Trump has upended 70 years of US support for free markets and the multilateral trading system, including the World Trade Organisation (WTO) that the US was central in creating. So even with the best will in the world, it would be a struggle for the EU to advance global free trade almost single-handedly. Moreover, the EU’s commitment’s to free trade is not as whole-hearted as it may seem. Yes, German business — whose global supply chains span Europe, China and the US — lobbied tirelessly for a G20 commitment to keep markets open. But Germany’s political-economic system is geared towards mercantilism — championing exports, while trying to limit imports — not free trade. 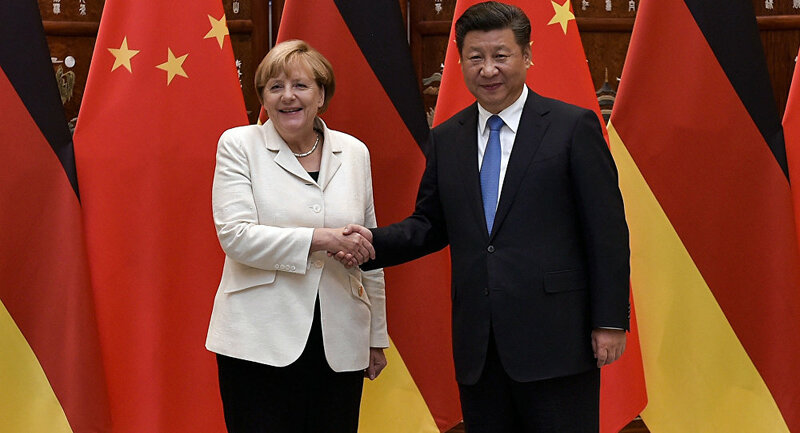 While German companies are among the world’s biggest global investors, now that China is taking an interest in German firms Berlin wants the EU to protect it from Chinese investments in “strategic” sectors. The country’s telecoms industry has also kept out foreign competitors, hampering digitalisation. While Germany’s infrastructure is stretched and sometimes even crumbling, “strategic” sectors such as the railways are starved of public funds while regulations and sometimes cronyish local politics discourage private investment. France remains France. While its reform-minded new president, Emmanuel Macron, wants to liberalise its labour market and shrink its overbearing state, his thinking on international trade is instinctively protectionist; like Germany he is clamouring for EU-level “investment screening” in strategic sectors. Indeed, while France wants the EU’s trading partners to open up their public procurement markets — witness the recent deals with Canada and Vietnam — Macron is demanding a Buy European Act along the lines the US’s Buy American legislation. Meanwhile Britain is leaving the EU, and while the Conservative government shouts that it wants the UK to become a Global Britain, a hard Brexit would leave the economy much less open to trade and people. To make matters worse, there is the threat of a trade war between the US and the EU that could undermine the multilateral trading order. The US government is conducting a “Section 232” investigation into steel imports with a view to restricting trade if these are deemed to threaten national security. Since steel is a widely traded commodity, any claim that relying on foreign steel jeopardises America’s ability to defend itself would be spurious — and likely violate WTO rules. European Commission President Jean-Claude Juncker upped the ante in Hamburg when he said the EU would respond within days to US tariffs with countermeasures restricting imports of US products. While Juncker often shoots his mouth off and such a decision would require the approval of EU governments, this is the first time on record that the EU has threatened to retaliate in a way that breaches WTO rules, which require the EU to win a case against the US at its dispute settlement system before taking action in a sanctioned way. The upshot could be a trade war that destroys the WTO. The EU has both a political and a commercial interest in maintaining the multilateral trading system. It is based on the belief that international relations should be governed by rules, not brute force, and its vast trade surplus means that it would suffer more than most from a trade war. But championing an open world will remain a tall order. Governments often fail to make the reforms needed to help people adjust to our deeply interconnected world and politicians often find it expedient to blame all sorts of economic ills on foreigners. Rethinking schooling, providing lifelong learning, building modern infrastructure and reshaping welfare states – the real solutions to the many economic ills that the West faces – is much more difficult than slapping a few tariffs, blocking a foreign take-over, or favouring an ailing local company over a much more efficient foreign firm in government contracts. The relatively liberal international legal order that has emerged in the last 70 years has rarely felt so fragile.